February 4, 2011 – San Jose, California A new temperature controller allows buildings to stop wasting electricity pumping hot water, 24/7, while maintaining optimum temperatures. Free Hot Water, a leading manufacturer and distributor of solar thermal products, introduces the new FHWH-CTDST-932PR differential temperature controller, intelligently designed to turn on or off building hot water pumps only when needed, saving electricity. 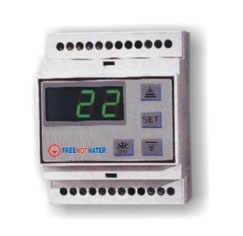 The FHWH-CTDST-932PR differential temperature controller is designed for automatically switching on or off hot water pumps for maximum hot water pumping energy efficiency. Typically, water is heated by a building’s gas water heating system, 24/7, and constantly circulated through the building, allowing for a constant supply of circulating hot water. The new FHWH-CTDST-932PR differential temperature controller saves buildings from unnecessarily wasting electricity circulating hot water by reading the temperatures of the water going out of the heating system, (T1), and of the water returning (T2). When this differential temperature (T2-T1) is higher than a set value (delta-T), the Free Hot Water Controller will switch on the pump. A universal sensor is supplied with the control. Larger systems available for multiple pumps. While the system is designed for any building, it can also be integrated into commercial solar thermal applications, as well. Reliable Digital Electronic Accuracy, LED indicates output relay status. Easy-to-Read Digital Display – displays sensor and functional status. Simple programming of differential set point temperature and (hysteresis) differential. Set point can be adjusted easily without going into programming mode. A tighter differential can be achieved (eg. 1F or 1C) than conventional electromechanical controls. Anti-Short Cycle Delay to ensure the output relay remains off for up to 254 secs to avoid unnecessary hard start and equipment wear. Two universal sensors P-01/P-02 are supplied with the control. Solid state temperature sensor probe can be extended up to 500 feet.